Morris Opp was a respiratory therapist at MeritCare Hospital in Fargo, ND from October, 1983 to May, 1987. He completed respiratory therapy school at Sioux Valley Hospital in Sioux Falls, SD in 1977 and became a registered respiratory therapist in 1979. After completing the RT program he then completed his Bachelors Degree at Augustana College also in Sioux Falls. Morris worked as a respiratory therapist in South Dakota until beginning work at MeritCare Hospital. Morris had been previously diagnosed with Hodgkin's disease, but at the time he joined the staff at MeritCare, he was in remission. Morris eventually moved into a position as supervisor of the RT float team. He was well respected by his employees and peer associates as a therapist and as a leader within the department. Morris was active in our professional organization as well, serving as the treasurer of the Dakota Society for Respiratory Therapy during the mid-1980's. In 1987, hoping for a cure for his Hodgkin's disease, Morris pursued the possibility of a bone marrow transplant. A transplant was performed in Omaha, Nebraska in May of 1987. Following the surgery, and the subsequent chemotherapy, Morris developed numerous complications, from which he did not recover. Morris died on May 12, 1987. Morris is remembered by those who knew him for his love of life and positive attitude, his awesome sense of humor, and the way he treated others with a sense of respect and fairness. 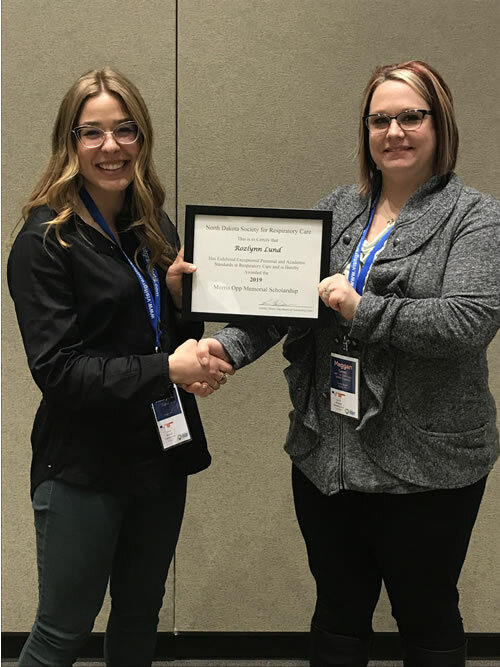 In honor of his memory as a respected professional and friend, the North Dakota Society for Respiratory Care established the Morris Opp Scholarship, which is presented annually to a deserving student enrolled in a respiratory care program in North Dakota. Applicants will be AARC/NDSRC members. Applications are reviewed anonymously by a committee consisting of three-five NDSRC members. Each category is rated on a scale of 1-10 individually by each committee member. After all applicants have been evaluated the scores are tallied. The applicant with the highest score is the recipient of the Morris Opp Memorial Scholarship. In the event of a tie, the applicants involved in the tie will be re-evaluated by the committee using the above formula until the tie is broken.